From "Time" to "Time", the album artwork of ELO and Jeff Lynne has been derived from existing canvasses. This is especially the case betwixt two sleeves for two albums released almost three decades apart. Back in 1983, ELO fans were treated to the visual montage adorning the tragically reduced 1LP issue of "Secret Messages" with the then four acknowledged members of ELO (Jeff Lynne, Bev Bevan, Richard Tandy and Kelly Groucutt) peeking out of two terraced windows at a scene including an angel, a stags head and classical art figures with cooling towers providing the backdrop. A little later we discovered that the album cover for "Secret Messages" - designed by David Costa - was based upon a piece of art entitled "The Future's A Bit Fishy, We've Got A Hand In It" (see above). Based on a street scene in Rochdale, you can obviously see the differences between the former and the latter - including the addition of an upstairs window (see below for more info on that), a streaking meteor and much, much more! Fast forward 29 years and the release of Jeff Lynne's "Long Wave". An album of fifties and sixties standards lovingly recreated by the ELO maestro. For this record, a more subtle embellishment was in order. Based on an original 1951 photograph provided by acclaimed Birmingham author and historian Alton Douglas of The Steam Clock pub on the corner of Sherborne Street and Morville Street in Ladywood (see above), the image of Jeff Lynne (and guitar) emerging from a doorway was the only obvious difference aside from the shortening of a lamp post in the foreground to make room for the album title and, of course, the words JEFF LYNNE! elobeatlesforever (elobf) recommends "How Things Are" by Hag and "Birmingham: Back To The Fifties" by Alton Douglas to those enlightened folks who appreciate ELO, Jeff Lynne, Roy Wood, 'Brum Beat', The Idle Race, The Move, The Beatles and related artistes. I always loved the sleeve of 'Secret Messages' with its attention to detail and all the classical art figures in the foreground. Sadly, it only served to make 'Balance of Power' even more like something dashed off in a couple of minutes. BOP's cover either...it reminded me too much of Yes 90125 and Big Generator albums. Don't like either of those covers, either. 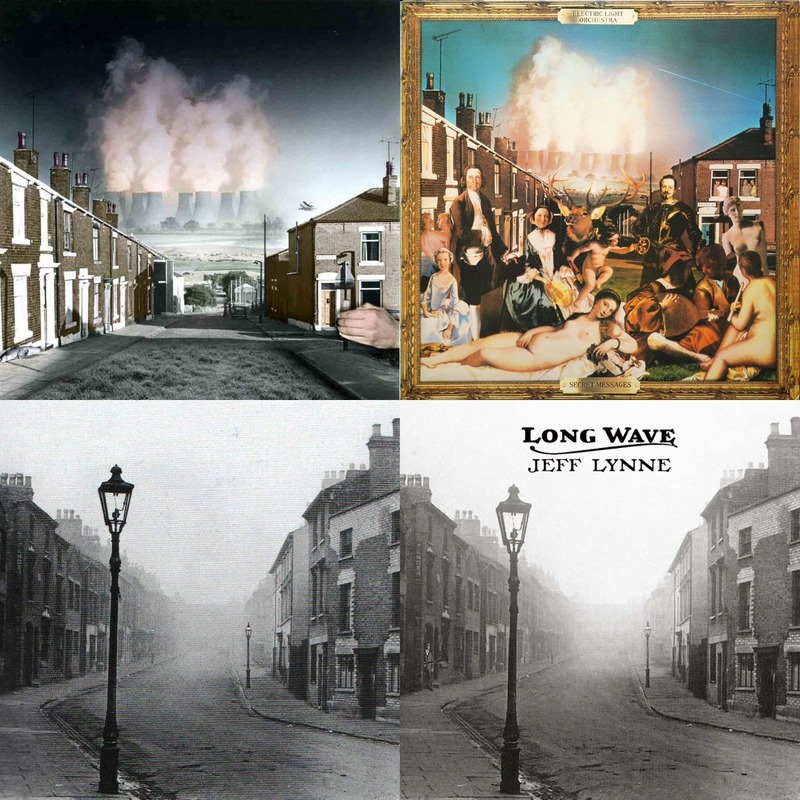 Long Wave.....Such an excellent cover. Perfect nostalgia.